If Barbas is asked about the origin of the axe, he will tell of Sebastian Lort, a powerful wizard, and his daughter, who worshipped Hircine. Sebastian prayed to Clavicus Vile to cure his daughter of her Lycanthropy, and in response, the Daedric Prince gave him the Rueful Axe. The Rueful Axe does not count as a Daedric Artifact for the Oblivion Walker Achievement. If you want to get the achievement you will have to accept the Masque of Clavicus Vile instead. If equipped, guards may comment on the axe, saying "Tis a wicked axe you wield there, friend. That blade looks sharp enough to cut through a god." 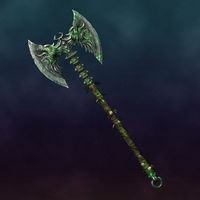 Whereas all other battleaxes have a speed of 0.7, the Rueful Axe's speed is 0.5, making it even slower than warhammers (0.6). As a result, it is the slowest melee weapon in the game. When the Axe is sheathed or unsheathed, the sound effect for a one-handed sword is played instead of a battleaxe sound effect.